Yorkie puppies available now, both show prospect and pet quality. 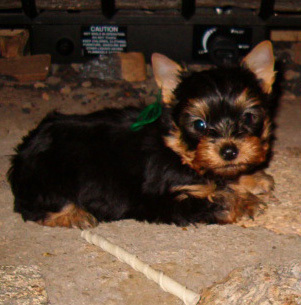 Individual Yorkshire Terrier pups are shown on the available page along with prices for your consideration. Prices for Daisy puppies born 10-27 (weight just over 4 lbs) are 900. 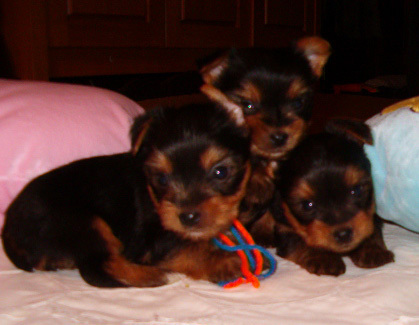 Check out available Yorkshire Terrier puppies for particulars on these pups as well. Jasmine pups were born on 11-16. Her pups range from 1000 - 1500. She weighs 4 1/2 pounds and Elf is a whopping 3 1/2 pounds. The first step is to fill out the questionnaire. Anyone who has previously purchased a pup receives a $50. discount on the next pup. We also have a couple of adult females available. 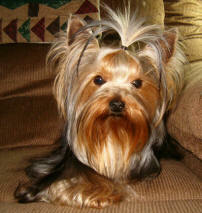 One is champion sired Yorkshire Terrier with a pedigree full of champions and MAY be sold to the right breeder. All of my animals are from Champion Yorkshire Terrier lineage, are AKC registered, and DNA and bile acid tested. This allows me to offer one of the best health guarantees in the business. My vets and my clients offer their recommendations and this is one of the reasons why. My Yorkshire Terriers cost me sometimes 4 times what I charge my customers because I believe in healthy, top of the line, good tempered, type yorkies to breed. ALL of my Yorkshire Terriers come with a health guarantee which is one of the best in the business. I stand behind each and every yorkie I breed . No deposits are accepted without a questionnaire first being accepted We do NOT sell to just anyone. We sell with a spay/neuter contract except for our show prospect pups. 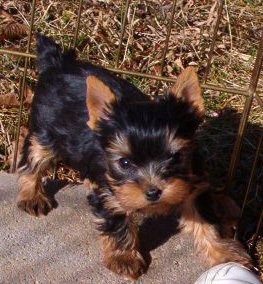 Young Yorkie puppies normally mature at about 4 pounds. Young Yorkies Newest Stud "Beau"
I am now here at home with the yorkies on a full time basis! It's nice being in country now with them where they can run and play. Please feel free to email me, this is usually the best way to contact me, but I do occasionally pick up a phone although it's not always the best way to reach me. My phone number is 828-656-2184. Please notice the new "Judging Yorkies" section as it contains some exceptional information written by Carolyn Hensley. This breakdown will make it easier for all to understand the Yorkshire Terrier standard outlined by AKC. I thank Carolyn for giving me permission to reprint. Attention: In addition to sorry breeders which I hear about at least once a week. People are getting sick dogs etc. and yes I still hear stories about the breeder mentioned below. The newest ploy over the internet seems to be people stealing photos from other breeders. I got a letter from a lady the other day telling me that someone had stolen my photos and had them posted on backpage.com This individual was asked to wire money to this "breeder" for a puppy. Then the breeder needed an additional 800. for shipping once he got to the airport. It never cost 800. to ship a puppy. It seems the address was even fake on this person. Wiring money is not a good practice. Regarding the Canadian Yorkshire Terrier breeder, I have gotten letters from other buyers who had the similar problems with them over the past months - now years. I ended getting a partial refund after my 7 week ordeal but they were not as fortunate. Some breeders will even go so far as to reopen under their spouse names after being shut down by the health department. Do your homework folks, ask the questions first, get the answers, see the pedigrees, get the information, read the contract, inspect the health guarantee. You may even wish to speak with others who have purchased from the breeder. Here are some important things to remember when buying a puppy from any breeder. Kennels / Breeders should not keep your deposit and change the terms of an agreement to suit their needs. The agreement should be given up front, you should not have to beg and plead for it. Lineage and pedigree should be available for inspection and not hidden like it's something to be ashamed of. Whenever you buy a puppy, (Yorkshire Terrier or otherwise) make sure you can get information about whom you are buying from, address, phone number and the like. Questions are your best weapon, they should ask you a lot and you should do the same. You want to know about your Yorkshire Terrier and they want to know you are giving him a good home. They should not be in hurry to push puppies out of their home for any reason. Six to ten week old puppies belong with their mothers. Your Yorkshire Terrier breeder should be open and up front, kind and good natured. After all this is who has been raising and socializing the new member of your family. If they do not possess these characteristics, you need to find a more reputable breeder because this is NOT the breeder you want handling your new yorkie. Is there such a thing as a teacup Yorkie? Why do you want FEMALE yorkie Puppy. Should I have my puppy fixed? Tell me how to get rid of the doggie breath. My Yorkie has a strange smell to him and he shakes his head a lot. all Young Yorkie puppies are sold with microchips. This is our way of saying "We care about our Yorkies and our customers. Our newest male yorkie puppy, our tiny sire Elf is growing very slowly. This 8 month old puppy is now a whopping 3 lbs 12 oz. This lil Yorkshire Terrier is a prize and is dying to prove what a stud he is! Thank you for using Young Yorkies"